Jake hates wearing shoes. He'd rather go barefoot, or wear flip flops, or wear slippers. 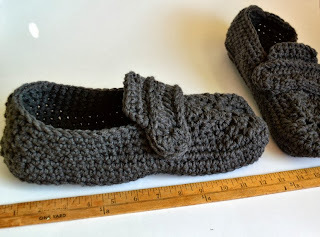 Unfortunately for him, he has size 16 feet, which makes the finding of flip flops and slippers pretty difficult, and (no shock here) really expensive. No discount shoe shopping for him! Lucky for me, the slippers were the perfect size! They're HUGE!!! LOL!!! The finished slippers turned out so cool!!! They are pretty slippery on the bottom so I think I'm going to make him some jute soles and maybe add some lines of silicone for extra grip. I'd hate for him to break something falling down the stairs in these things... LOL!! Best and worst gift ever?! I also made some manly soap this week. 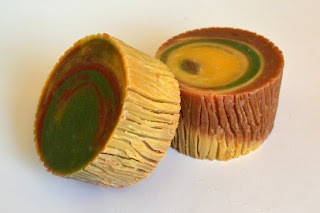 I used the cylinder pour method from Soap Crafting to make my Mountain Man soap... I scraped the outer edge of the soap with a fork to make it look like tree bark. 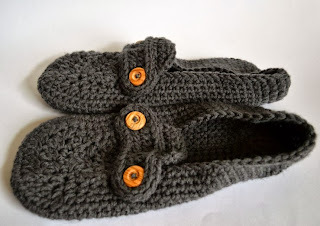 My brother-in-law's birthday is coming up. I crocheted a jute basket to hold some of the soaps. 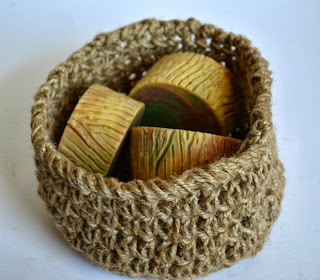 I love the rustic look of the jute. 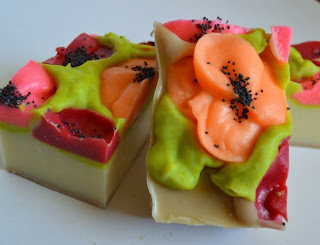 The natural look is so great with the soap. 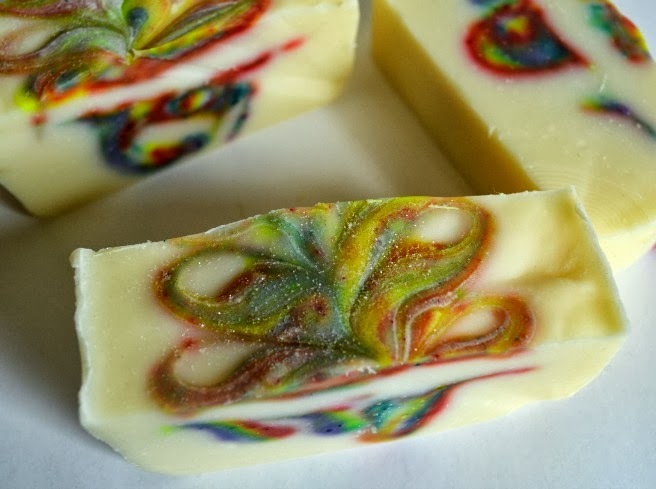 I also experimented with the Mantra Swirl technique from Soap Crafting this week. I got a little crazy and made a rainbow mantra swirl. And then I flung a bunch of cosmetic grade soap glitter on it. Unicorn soap?! If you'd like to try them yourself, here's the video that inspired me! I can hardly believe you are progressing so quickly with your projects; A veritable woman on fire! Good for you, if that means you are enjoying the process. Your soaps are so unique-looking and beautiful, I can only imagine the scents you're using. If it works for you, don't give it a second thought!! You go girl. LOL!! I AM a woman on fire! Actually, I am a woman who is super happy her kid is back in school! :D I don't know what to do with all of my free time! I adore your version of the poppies! The color combination is absolutely lovely! Thank you so much!! I am such a huge fan! Your videos are amazing, and they are so easy to understand. And your piping soap recipe is AWESOME!! Thank you so much for the inspiration!